Let’s get real, everything tastes better on the grill, and these Grilled Sweet Potato Wedges are certainly no exception! Paired with a lightly spiced curry tahini dip, these soft on the inside and crispy on the outside grilled sweet potato wedges are the perfect summer side dish. Sweet potatoes are one of my favorite starchy carbohydrates to add to any meal. Not only do they taste great, but they are incredibly versatile to prepare and work equally well for breakfast, lunch, and dinner. In fact, they work well for sweet and savoury dishes alike, and can be made into everything from a mash to noodles to these grilled sweet potato wedges! For this particular recipe, I wanted to keep things simple while still having a little fun. The sweet potatoes themselves are pretty straightforward, just a bit of oil and seasoning, but the curry tahini dip helps to add a little extra flavour. I simply added paprika and sea salt to the poatoes before popping them on the grill, but feel free to add some extra seasonings if you like. For the best results (and pretty grill marks), make sure that your grill is nice and hot before adding the sweet potatoes, this will help ensure these grilled sweet potato wedges cook evenly and look as good as they taste. These grilled sweet potato wedges are ready in under 10 minutes for a quick and easy side dish. Serve immediately with curry tahini dip, or a dip of your choice, or store them in an air-tight container for up to 3 days. In a bowl, combine the sweet potato wedges, olive oil, paprika and sea salt, and toss until sweet potatoes are well coated in the oil and seasonings. Prepare the dip by combining the ingredients in a food processor, or whisk in a small bowl, until well combined. Set aside. 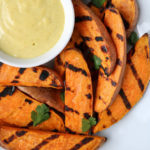 Place sweet potato wedges on the grill and cook for 3-4 minutes per side or until grill marks appear, turning only once. If possible, cover the grill with the lid while cooking to help them cook evenly on the inside. 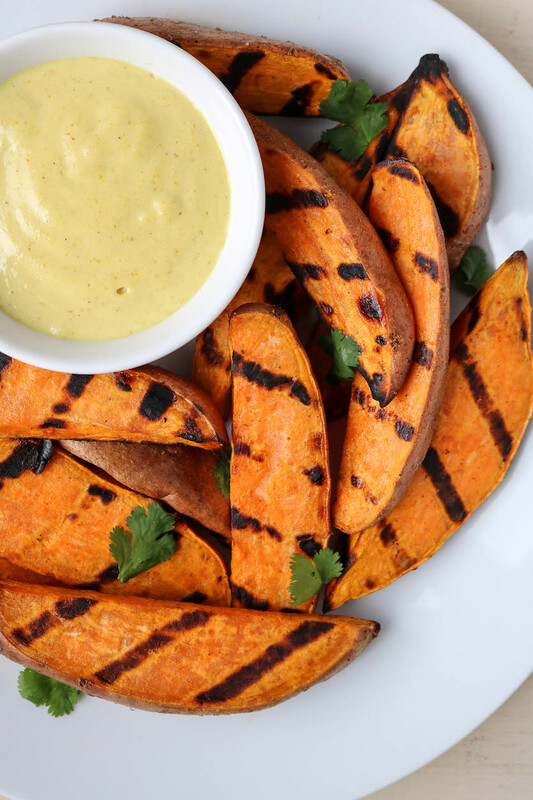 Once sweet potato wedges are cooked, transfer to a plate and serve with the curry tahini dip.